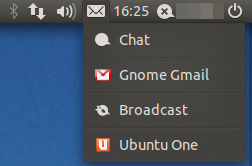 Also, I didn’t need to add the gnome-gmail file to /usr/share/indicators/messages/applications/gnome-gmail, but I’m using Natty, so that might just work now. Thanks for the refinement ! Have added this to the post. I was using Natty Beta as well – looks like some issues are already fixed. Hopefully the MIME Type will be added as well as it is already a known issue. What do you mean with this? Do I have to create a new document en copy-paste the code or something? Sorry, new Ubuntu user here. Nvm nvm, figured it out, eventually. It’s working, thanks! You can delete all my posts lol. Great! Thank you. Finally got this working after installing gnome-gmail several times on Natty. 3) I believe update-desktop-database also needs a “sudo” in front of it. After doing this Gnome Gmail finally shows up in Preferred apps. Whoop whoop! You are of course right – all these commands need to be run as root (apt-get as well). Saves having to sudo everything when doing admin tasks. But I will add this as an edit above. Thanks so much for this. I use it on UbuntuStudio (11.04/Natty) and it works perfectly.